This is a new painting, a 16″ by 20″ canvas, that is part of Haven, my solo show that opens Friday at the Principle Gallery in Alexandria. It is titled Seeking the Design. I chose the words above from the Nobel Prize speech from the late author Gabriel Garcia Marquez to accompany this painting even though Marquez was speaking above how the people and countries of South America had suffered over the centuries by trying to adhere to patterns of behavior and expectation imposed upon them by foreign influences. These words spoke to me on a more individual level. We often live our lives according to the norms and expectations of others, following well worn paths from which we seldom, if ever, depart. As a result, we often become no more than others expect us to be. It as though we have not even attempted to find our own pattern, our own design for living. And that is what I see in this painting. 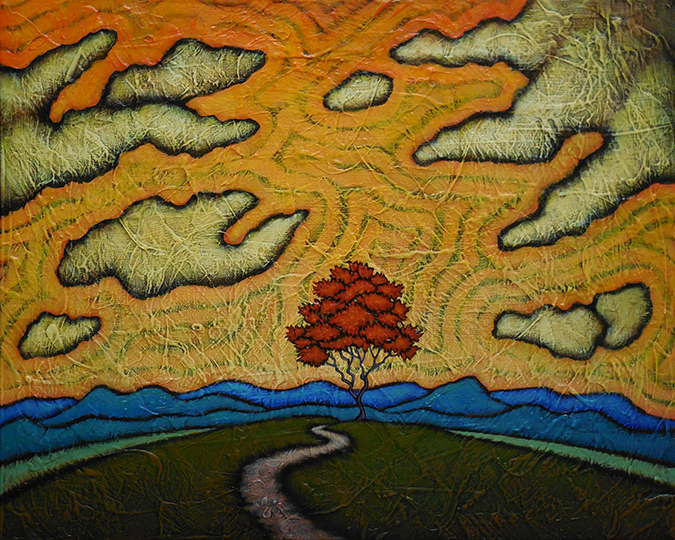 The Red Tree, an earthly being, has come to the end of that worn path and must make a decision about how to proceed. 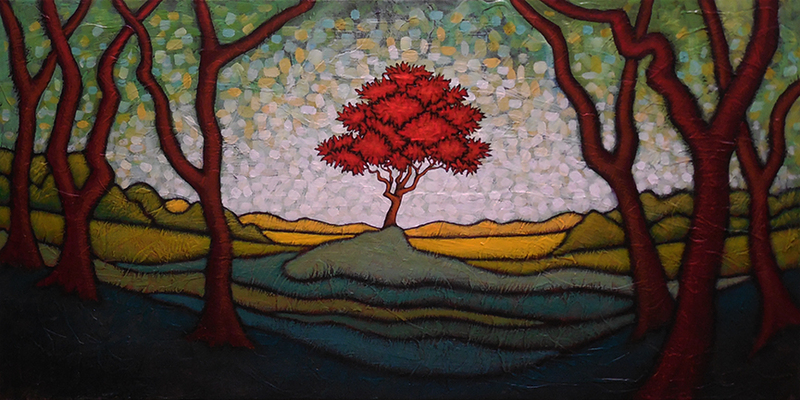 While there are multitudes of options revealed in the maze-like underpainting of the sky and earthly options that likely exist beyond the layers of distant hills, the Red Tree must choose between finding the pattern that best suits its own desires and needs or going back on that path to follow in the footsteps of the crowd that travels along it. I get the feeling that latter option would result in one feeling, as Marquez pointed out, more unknown, ever less free and ever more solitary. For me, this painting has a nice harmony between dark edged weariness and colorful optimism. It is both scary and invigorating in finding one’s own design or pattern to follow. I believe the Red Tree will be following its own path. I wish I had a bit more time this morning to write about this smaller painting, a 10″ by 20″ canvas that takes it title, Nature’s Heart, from the words above from the fabled naturalist John Muir. There has been a recent assault on many of the protections given to our environment and we can’t afford to idly stand by while this happens. We need clean air, clean water and clean soil to continue as a species. Just as important, we need those pristine places where we can wash our spirits clean, as Muir said. I see this piece as a plea for everyone to take a position as caretakers of the world in which they aim to prosper. Take an active stand. Listen and speak up. This painting, Nature’s Heart, is part of Haven, my solo show at the Principle Gallery in Alexandria that opens next Friday, June 1. Just a month out from my solo show, Haven, at the Principle Gallery. The work for the show as a whole is shaping up well and I am going through waves of elation and anxiety as I prepare. The elation comes in the way I feel the new work is finishing off and the anxiety in that I fear my judgement might be off base a bit, that what I am seeing and feeling in the work might not come across to others. That I am working with my head in the clouds. Fortunately– or unfortunately–that anxiety is not new to this show. I’ve had it in varying degrees for every single show I’ve done over the past two decades. This is my 19th solo exhibit at the Principle Gallery and my 52nd or 53rd solo show overall and I can’t remember ever feeling absolutely confident in how people would react to what I was doing. But so long as I have faith in my own reaction to the work, that I trust that I am experiencing real feeling from it, then I live a little easier with that anxiety, even though it never fully recedes. The piece shown here is a new painting, 24″ by 12″ on canvas, that elicits the elation I described above. It checks every box for what I wanted from it. It has an equilibrium of fineness and roughness that appeals to me. There is a cleanness in its design that makes it feel solid and whole to my eye. 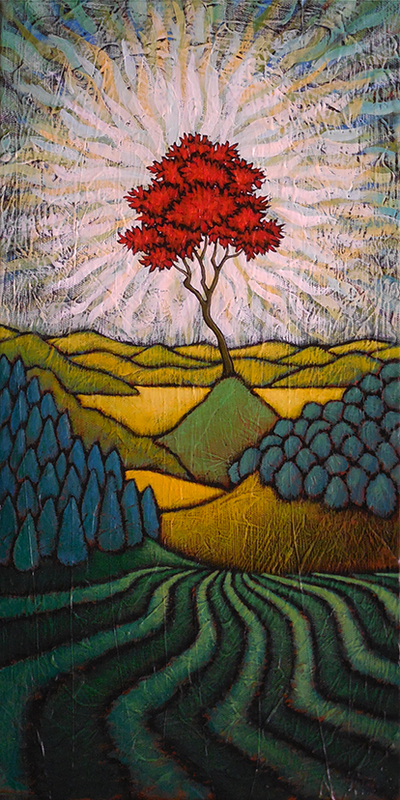 It draws me in and lets me feel that I am the Red Tree here and it is a fulfilling experience. It makes me feel good, to put it plainly. Now, I must note that these are my reactions. You might look at it and feel nothing. That is no less valid a reaction than my own. But because I know what I am feeling is true and genuine for myself, the anxiety of showing it to someone who might not feel anything from it is lessened. So, with that thought in mind, I must get back to work. This new painting has been sitting within my sight for several days now. I can only speak for myself but I find it really easy piece in which to withdraw, imagining myself in that place, in that moment under that sky. There’s a sense of ease and comfort in it for me. Yet there is something enigmatic about it. While there is an air of easiness and acceptance in the painting, there is also a feeling that there is some sort of questioning taking place. Perhaps a wondering of the why’s and what’s and how’s of this universe and our place in it? Or the existence of a god or gods? Or the nature of good and evil? Or perhaps something less weighty. But even with this questioning there is still a great calmness and ease, as though the Red Tree in this time and place knows that having those answers would not make this particular moment any better. And perhaps in that moment when a question does not require a response, an answer shows itself.